As noted in a previous post, my oversize 11 x 17 Mustek scanner of nearly 9 years died in action just as I entered the home stretch of finishing issue 11 of Rob Hanes Adventures. Replacing it turned out to be a more arduous task than I expected. Although I ordered the correct scanner online—an older Mustek model, the A3 USB, that was compatible with my Windows 98 system—upon delivery I immediately noticed that the merchant sent me the newer A3 1200 Scan Express Pro, which is not Win98 compatible (sue me, I'm a dinosaur—but why fix what ain't broke?). Although the merchant did work conscientiously to correct the problem by making a direct exchange, the snafu set me back further in my schedule. Fortunately, the manufacturer still had a few of the discontinued models still in stock, which it shipped to me. But when I opened the box upon delivery, I discovered that it was missing the power adaptor plug!! The manufacturer agreed to send me the missing adaptor, but that set me back another few days. Once I received it, I got the scanner up and running in no time and am now back in business. 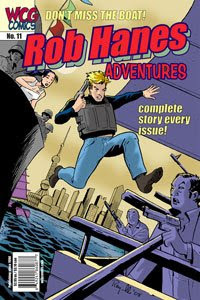 Above right is one of the first products of the new scanner—I was finally able to scan the cover to Rob Hanes Adventures #11 and begin coloring it. Click on the image to see it full size. And, of course, to see a fuller preview of the upcoming issue, click here.